Introduction: Very high myopia is usually associated with posterior staphyloma. The pathology, management and our experience reported in the article. Methods: We studied a total of 3737 student population in schools and colleges in the year 2001 — 2002 with the help of the Principals and teachers. High myopic patients treated in our hospital (242 patients) who underwent B—Scan and surgical management in two stages, posterior scleral support operation followed by low power intraocular lens implantation, have been included in the study(14). Discussion: High myopia and keratoconus have opposite effect in the anatomy of eye ball. In high myopia, the anterior segment of the eye is usually normal or there may be slight variation in the depth of anterior chamber whereas in keratoconus the posterior segment is normal. Staphyloma, usually occurs in the posterior pole of the eye ball involving the macular region can also expand anteriorly leading to thinning of sclera to be observed as bluish bulging. As the posterior staphyloma progresses, the retina undergoes degenerative changes due to stretching in the macular region, around the ora-serrata and around the optic disc also. In the posterior pole, the thinning of sclera and retina leads to a decrease in the functional efficiency of the retina which is often misconstrued as amblyopia especially in uni-ocular high myopes. In majority of such cases, surgical compression of the posterior pole by preserved donor sclera from behind reverses the damage and restores full vision when followed by low power intra ocular lens implantation. Results and Conclusion: 242 high myopes, among which 212 patients with Bilateral and 30 patients with unilateral involvement were included in this report and final visual outcome analyzed. In the surgical management of very high myopes, it is mandatory to manage the posterior staphyloma to get good visual outcome. To arrest the myopic progression, P.S.S.O. should be performed in young age itself. Extraordinarily, high myopia is prevalent among 7% of the total myopic population. In an earlier study on the posterior fundus of the myopic eye based on changes on the axial length measurements and fundus, an increase in the prevalence of the posterior staphyloma from 1.4% with axial lengths of 26.5—27.4 mm to 71.4% with an axial length of 33.5—36.6 mm was observed; further in 77.5% of the staphylomatous eyes, a significant interrelationship between posterior staphyloma and chorioretinal atrophy associated with degenerative changes was observed. Among the myopic population, people having >−6 D or anteroposterior length of >26 mm are considered as high myopes; those with >−8 D constitute about 6%—18% of the high myopic population. The pathogenesis of high myopia is not known. In England, pathological myopia is one of the main causes of blindness in the age group of 40—60 years; the USSR (Russia) and Germany rank the second and the United States the seventh. In Canada, 9% of blindness is due to pathological myopia. The sclera is a dense, fibrous, elastic connective tissue that forms the outer coat of the eye; it consists of irregularly arranged lamellae of collagen fibrils interspersed with proteoglycans and noncollagenous glycoproteins. The scleral fibroblasts located between scleral lamellae are responsible for the synthesis of the extracellular matrix. Hence, the sclera is not a static container of the eye, but rather a dynamic tissue which can alter the composition of the extracellular matrix and its biomechanical properties which, in turn, regulate the ocular size and refraction in response to visual environmental cues. These studies warrant a strategy for reversing myopia-associated scleral extracellular matrix remodeling, particularly in cases of high myopia in humans. Data from the 1971 to 1972 National Health and Nutrition Examination Survey were used to estimate myopia prevalence rates for persons in the United States between the ages of 12 and 54 years. When persons were classified by the refractive status of their right eye, 25% were myopic. Significantly, lower prevalence rates were found for male patients than for female patients and Afro Americans and other American population. Myopia prevalence rose with family income and educational level. The importance of income and educational level may result from their association with near work, a factor that has been implicated in the pathogenesis of myopia. Ashkenazi Jews, especially Orthodox Jewish males have a higher prevalence of very high myopia than the white U. S. and European populations. Children with a family history of myopia had on average less hyperopia, deeper anterior chamber, and longer vitreous chamber even before becoming myopic. The influence of the study habits on myopia in Jewish teenagers has been reported. Anteroposterior length is the largest contributor to the determination of refractive error (with a significant correlation between refraction and ocular biometry). Increased lens thickness correlates with increased myopia. Variations in ocular biometry have been reported in the adult Chinese population in Singapore. A dizygotic and monozygotic twin study showed 90%—93% heritability for lens thickness. The importance of genes and environment for ocular refraction and its determiners has also been documented in among 20—45-year-old twins indicating the interaction between genes and environment. The fundus changes observed in conjunction with pathologic myopia most notably lead to blindness in highly myopic individuals. Biomechanical changes are tears in Bruch's membrane/Pigment epithelium/Chorio capillaries (Lacquer Cracks) which occur in the macular region usually within posterior staphyloma. Other changes are posterior vitreous detachment, retinal detachment tilted optic nerve, myopic choroidal neovascularization. To prevent these adverse biomechanical changes and to reduce the deterioration of vision, we have been successfully adopting posterior scleral support operation (PSSO) as a prophylactic procedure. After an interval of >1 month, clear lens removal and low power intraocular lens (IOL) implantation are performed to restore unaided vision. In the past two decades, PSSO had been widely practiced by Akira Momose of Kiriyu in Japan and Fyodorov of Russia. Lack of opportunity to look at long distance as most children in the urban area live within the four walls at home and in schools. We studied a total of 3737 student population in schools [Table 1] and colleges [Table 2] in the year 2001—2002 with the help of the Principals and teachers. One set of pro forma was given to students of Madurai Medical College, Thiagarajar College Of Engineering, Sethu Institute of Technology, SVN College of arts and sciences Nagamalai Pudukottai, Vivekananda School Thiruvedagam, APN School Keeraithurai. 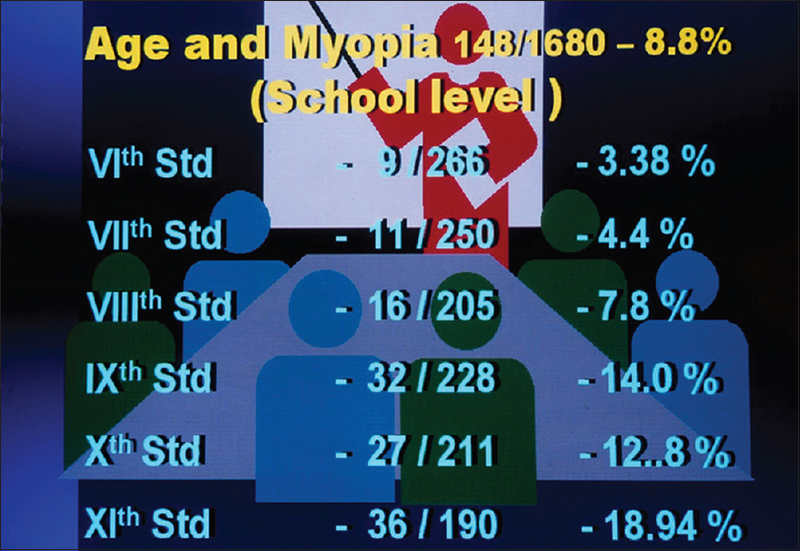 Based on feedback, the incidence of myopia [Table 3] was assessed in different student groups. Students who were not sure of their spectacle powers were excluded from the study. High myopic patients treated in our hospital (242 patients) who underwent B—Scan and surgical management have been included in the study. We correct high myopes [Table 4] and [Table 5] with posterior staphyloma in two stages, namely, PSSO as prophylactic procedure [Table 6] and [Table 7] and low power IOL implantation after clear lens removal as a sight enhancing procedure [Table 8]. PSSO is done in adults under peribulbar anesthesia and under general anesthesia in children [Table 5]. The conjunctiva is separated all around except in the medial side, 5 mm away from the sclerocorneal junction. 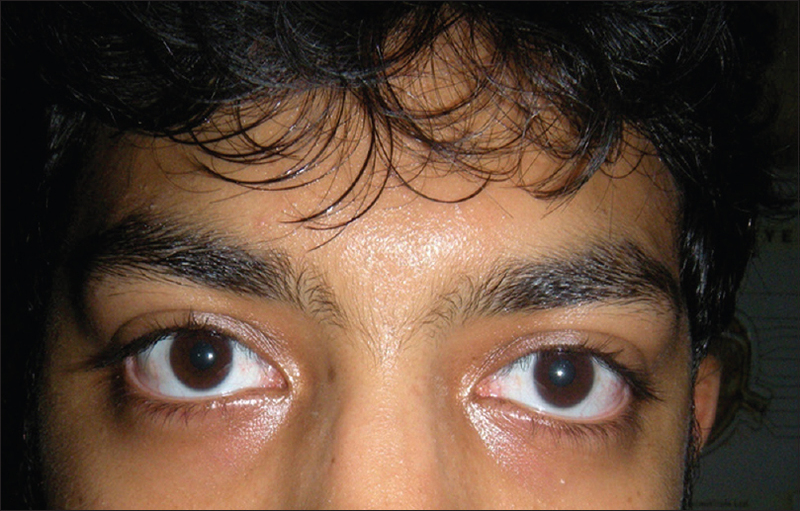 In several cases, the thinned out bluish sclera due to the visibility of the underlying choroid can be seen [Figure 1]a. The lateral rectus muscle separated and held by muscle hook. The inferior oblique muscle is then identified and held by another muscle hook. The tissues between these two muscles will be cleared. 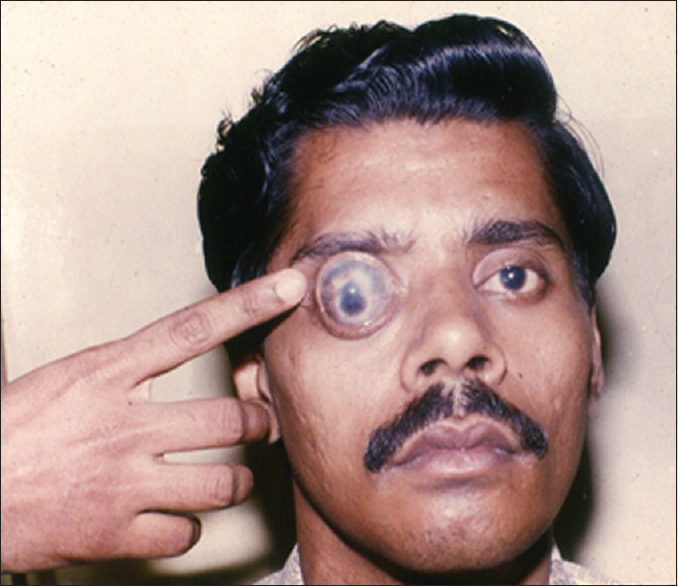 The scleral graft 5 cm × 1 cm is inserted behind these two muscles. The tips of the scleral graft are taken below the superior and above inferior recti muscles and sutured by 5 o’ dacron suture material into half thickness of sclera [Figure 1]b. The conjunctiva is sutured by 6 o’ silk as a continuous suture, which will be removed after 5 days under topical anesthesia. Care should be taken to avoid scleral perforation while suturing the donor scleral graft and damage to the blood vessels, especially the vortex veins. Placement of the scleral graft should be more posterior so that the placement is closer to the macular region and anteroposteriorly compressing the eyeball. Too much pressure of the graft over the posterior pole is not necessary as the tissue pressure will give adequate compression of the staphyloma. The donor sclera obtained from the eye bank is preserved in glycerin and rehydrated in normal saline half an hour before surgery and kept in Betadine solution to ensure sterility of the graft. Commercially, lyodura is available as presterilized graft. 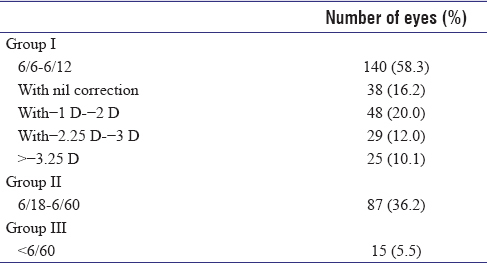 In this regard, the lens extraction alone as advocated by Fukula in the early part of 20th century and the recently advocated Lasik procedure and implantable contact lens (ICL) do not arrest the degenerative changes of the posterior segment [Table 9]. 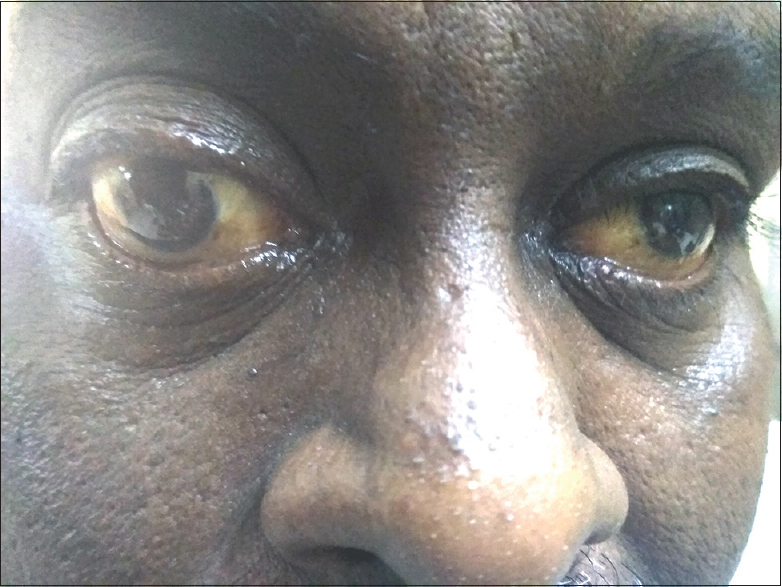 When sclera is placed nearer to the macula, near the insertion of the inferior oblique muscle, the aseptic inflammatory reaction of choroid occurs enhancing blood circulation to the macula. Thus, PSSO has dual action, biomechanical, and vascular. 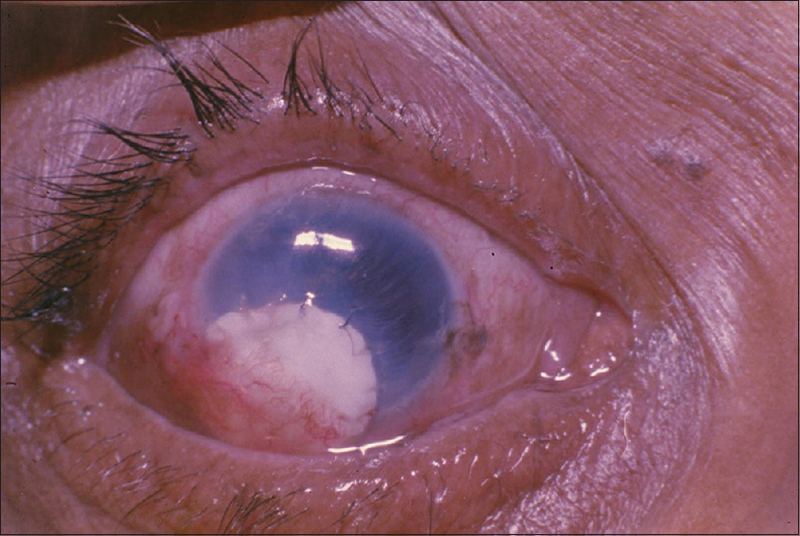 By insertion of the tectonic graft to cover the perforated cornea on an emergency basis this vascular reaction has been observed and recorded [Figure 2] and [Figure 3]. The graft in situ can be observed beneath the conjunctiva [Figure 4]. 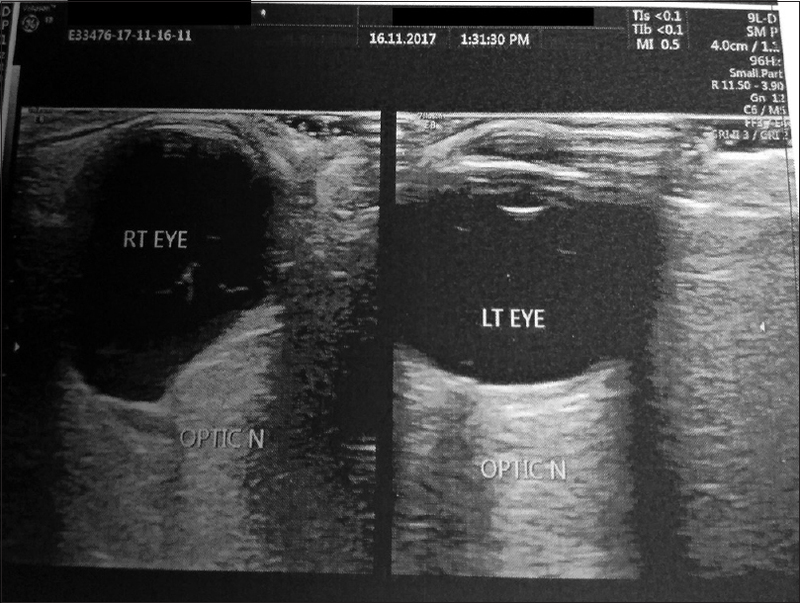 Several cases of unilateral high myopia [Table 6], misdiagnosed with proptosis during the routine clinical examination, can be easily ruled out by refraction alone which could be confirmed later by ultrasonography [Figure 5] and [Figure 6]. Tribals and aborigines do not have myopia, whereas educational achievers have more myopia. Children studying in village schools have a lesser incidence of myopia than in urban schools. Further, the incidence of myopia increases from 6th standard to school final [Figure 7]. It has also been observed that among students of Arts, Engineering, and Medical, the medicos have the highest incidence of myopia and no statistics available among ophthalmologists. The study of myopia among various populations proves that myopia is directly related to the eye strain in young age to achieve academic excellence. It appears that the misuse of eyes for more near work, unlike animals, leads to the incidence of more myopia. Interestingly, most myopic children have myopic parents. However, very high myopia does not follow this criterion since children of nonmyopic parents have been recorded to have very high myopia. It has also been found in newborn babies [Figure 8] and [Figure 9], and more surprisingly, it occurs unilaterally and progresses throughout the life [Figure 10]. In another case, a 3-year-old boy was seen with-18D and the parents were unwilling for PSSO. 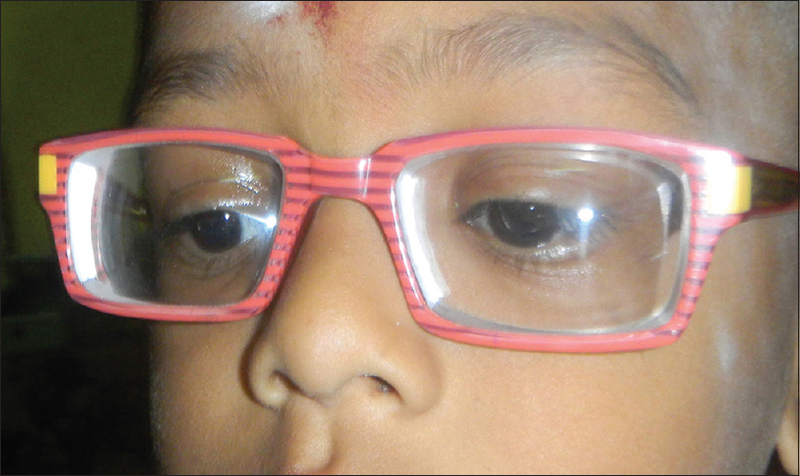 When the boy was brought again at the age of six, myopia had progressed to-36D. 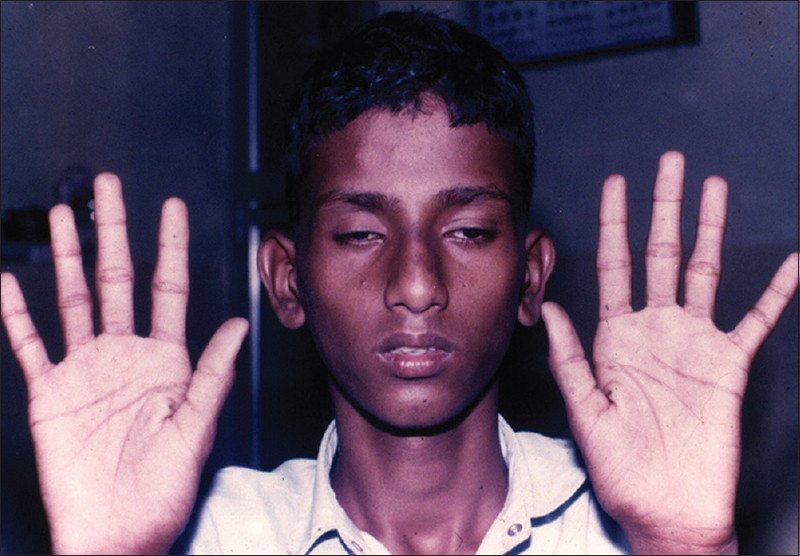 Very high myopia occurs in association with Marfan's syndrome and congenital anomalies [Figure 11],[Figure 12],[Figure 13]. 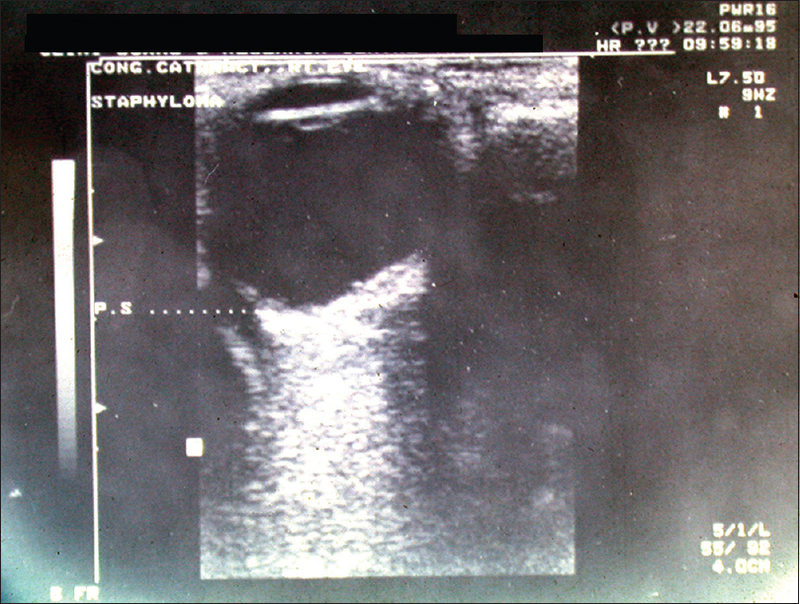 Ultrasonic evaluation by B-scan confirms the presence of posterior staphyloma [Figure 14],[Figure 15],[Figure 16]. Von Graefe is generally credited with the first study of the posterior staphyloma, which he ascribed as sclerochoroiditis. Myopia is the most common refractive error and affects ~25% of adults in the United States. In USA, 0.2%—0.4% of the general population are classified as degenerative myopes while 1% of the Japanese population (approximately 1.25 million) are degenerative myopes. Overall, 6%—18% of myopes meet the degenerative criterion., In Japanese children, posterior staphylomas are not common in pathological myopia. 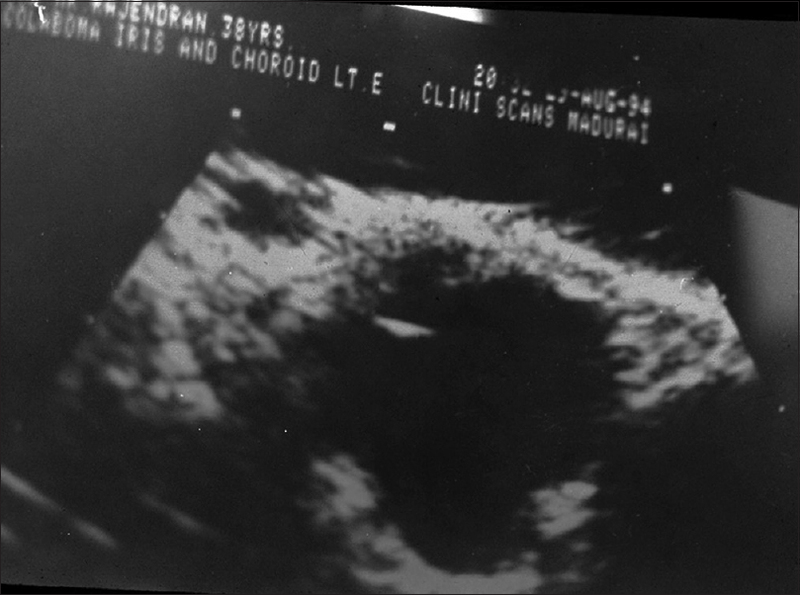 However, we have recorded posterior staphyloma in a 9-month-old child. The fundus shows the presence of posterior staphyloma as deep excavation involving the macular region and in extreme cases show degenerative changes in maculo papillar region involving the macula [Figure 17]. In one of our cases, we have recorded, the staphyloma had extended anteriorly up to the sclero corneal junction of the eyeball. He had myopia of-49D with useful vision in his affected right eye [Figure 4]. In the past, myopia was considered as inherited. Now it is a common observation that the incidence of myopia is increasing and many kids are becoming progressively myopic without any family history, essentially due to lifestyle changes such as overuse of near vision for reading, watching TV, mobiles, and computer usage. Children are also conditioned to go to schools at a much younger age than in the past. Myopia is becoming a more common problem among urban children. Its prevalence increases from VI standard to XI standard, designated as school myopia. The need for more near vision in reading and writing, for acquiring academic skills, may be the reason for this. Even in populations like Eskimos where myopia was rather unknown previously, have myopia today. In Japan, the incidence of myopia is increasing alarmingly-from 15% in 1920 to 30% in 1940 and 50%—60% in 1985. Our data collected shows that more medical students are myopic than their counterparts in other colleges (ref). The incidence of myopia increases with positive family history also. 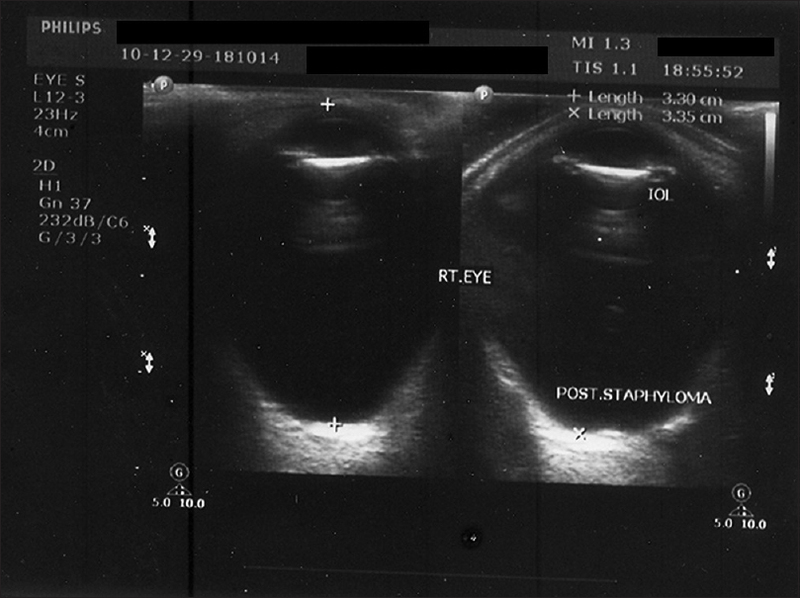 Posterior staphyloma occurs due to elongation of the posterior pole of the eye causing incorrectable defective vision by conventional methods. The present study indicates that the arrest of myopic progression in early age and reversibility of refractive power to some extent in adults are possible by PSSO. Low power IOL implantation later can restore full vision and hence is a more appropriate logical solution to high myopes. Several procedures have been adopted for the management of high myopias. The popular methods being clear lens removal with or without IOL implantation, insertion of ICL in the anterior chamber in phakic eyes, alloplastic refractive keratoplasty, PRK, LASIK homoplastic keratomileusis, myopic intracorneal lens as well as the use of contact lenses. When compared to the results published in the world literature, our results are more satisfactory in ensuring attainment of full normal vision, reversibility of degenerative changes and recovery of full visual acuity in amblyopic eyes. The morphologic features of staphylomas worsen as the patient ages. PSSO appears to be the physiological approach in the management of pathological myopia and should be carried out in early age itself to stop further progression. 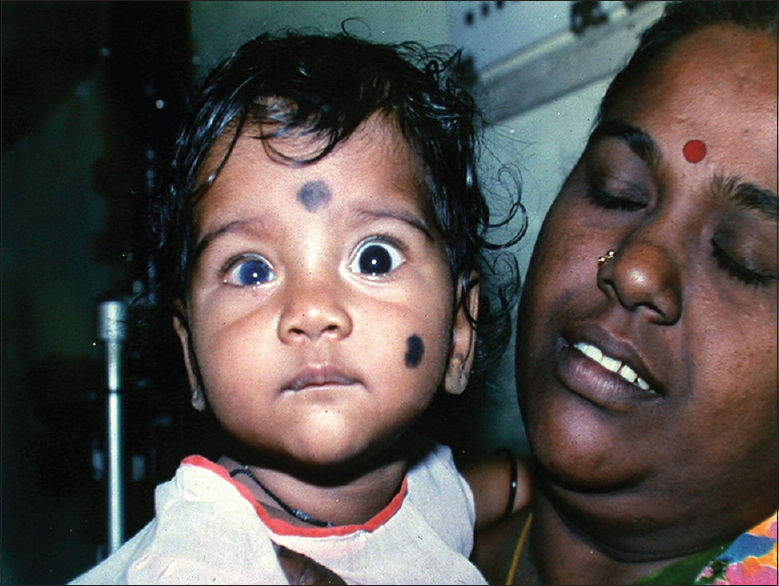 Recently operated child with-18D has shown good improvement of vision [Figure 18]. PSSO is indicated in progressive myopia in children to arrest its advance as propagated by prof. Momose to be later followed by low power IOL implantation. I express my gratitude to Prof. Akira Momose of Kiriyu, Japan who opened up my eyes to surgical management of Myopias, Prof. Dr. Chellam Balasundaram PhD., (Rtd), Professor of Animal Sciences, Bharathidasan University, Tiruchirappalli and Dr. Muralikrishnan, PG student for critically going through the manuscript and giving valuable suggestions. Also thanks to Mr. B. Athikannan of G. K. S. Computers for his secretarial assistance. Curtin BJ, Karlin DB. 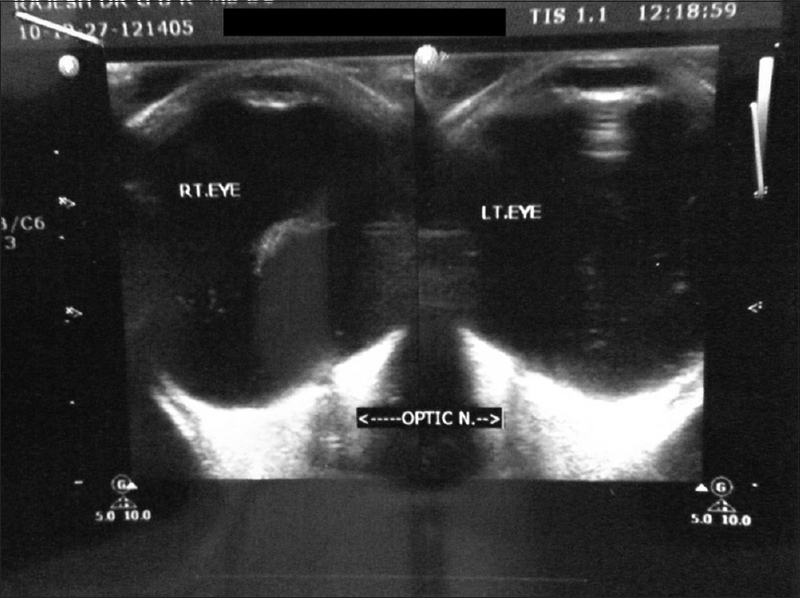 Axial length measurements and fundus changes of the myopic eye. I. The posterior fundus. Trans Am Ophthalmol Soc 1970;68:312-34. Scott AW, Fekrat S. Pathologic myopia. Albert & Jakobiec's Principles & Practice of Ophthalmology. 3rd ed., Ch. 154. Available from: http://doctorlib.info/ophthalmology/principles/33.html. [Last accessed on 2017 Dec 09]. Curtin BJ. The posterior staphyloma of pathologic myopia. Trans Am Ophthalmol Soc 1977;75:67-86. Rada JA, Shelton S, Norton TT. The sclera and myopia. Exp Eye Res 2006;82:185-200. Sperduto RD, Seigel D, Roberts J, Rowland M. Prevalence of myopia in the United States. Arch Ophthalmol 1983;101:405-7. Zylbermann R, Landau D, Berson D. The influence of study habits on myopia in Jewish teenagers. 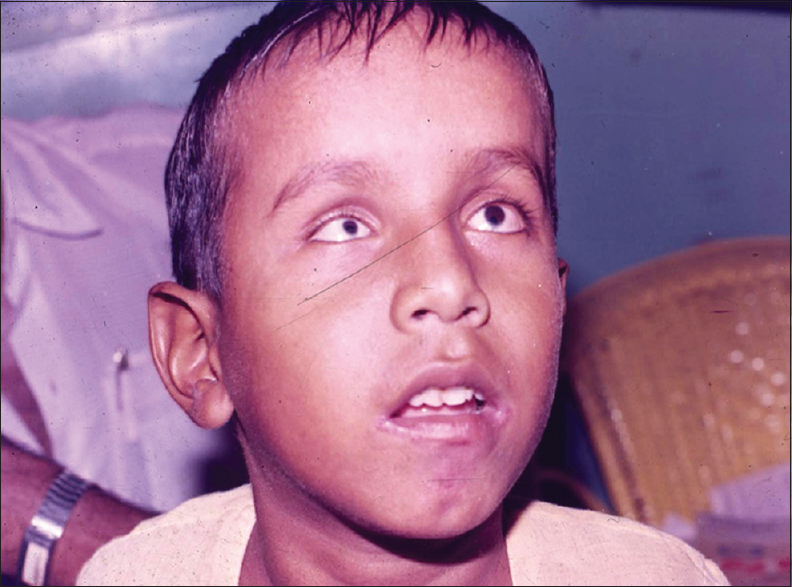 J Pediatr Ophthalmol Strabismus 1993;30:319-22. Touzeau O, Allouch C, Borderie V, Kopito R, Laroche L. Correlation between refraction and ocular biometry. J Fr Ophtalmol 2003;26:355-63. Wong TY, Foster PJ, Ng TP, Tielsch JM, Johnson GJ, Seah SK, et al. Variations in ocular biometry in an adult Chinese population in Singapore: The Tanjong Pagar survey. Invest Ophthalmol Vis Sci 2001;42:73-80. Lyhne N, Sjølie AK, Kyvik KO, Green A. The importance of genes and environment for ocular refraction and its determiners: A population based study among 20-45 year old twins. Br J Ophthalmol 2001;85:1470-6. Harper AR, Summers JA. The dynamic sclera: Extracellular matrix remodeling in normal ocular growth and myopia development. Exp Eye Res 2015;133:100-11. Hung GK, Ciuffreda KJ. Incremental retinal-defocus theory of myopia development — Schematic analysis and computer simulation. Comput Biol Med 2007;37:930-46. Zhang Y, Wildsoet CF. RPE and choroid mechanisms underlying ocular growth and myopia. Prog Mol Biol Transl Sci 2015;134:221-40. Baskara Rajan GM. Yopia and intelligence. J TNOA 2003;43:17-9. 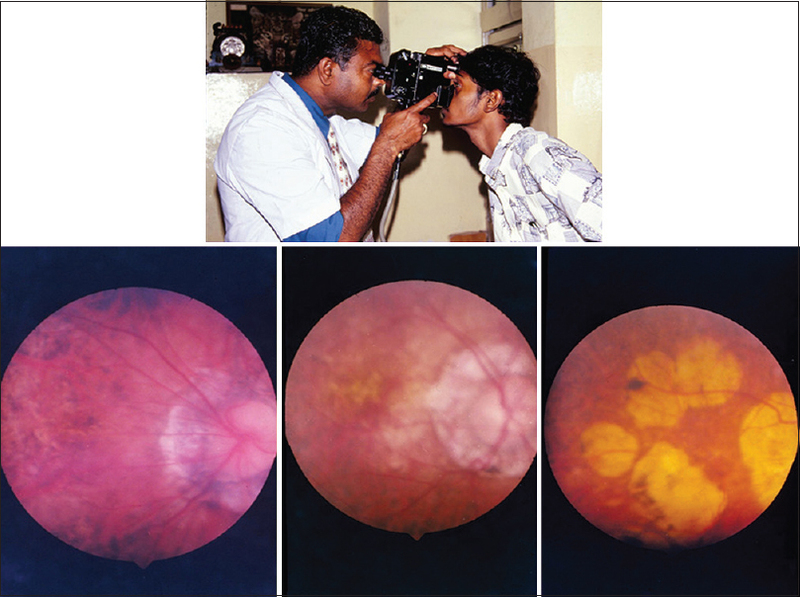 Baskararajan G. Surgical correction of high myopias — Analysis of 243 cases. J TNOA 1999;XXXX:27-30. Hsiang HW, Ohno-Matsui K, Shimada N, Hayashi K, Moriyama M, Yoshida T, et al. 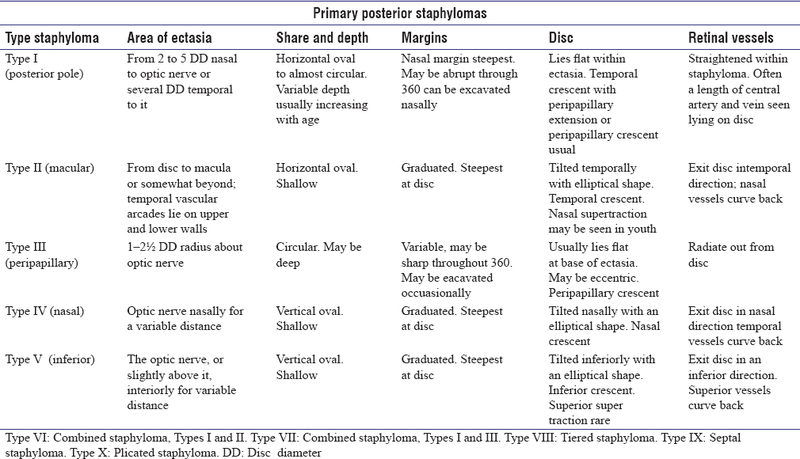 Clinical characteristics of posterior staphyloma in eyes with pathologic myopia. Am J Ophthalmol 2008;146:102-10. Momose A. The Japanese experience with the posterior scleral support operation combined with various refractive surgeries. In: Thompson FB, editor. Myopia Surgery Anterior and Posterior Segments. New York: Macmillan Publishing Co., Inc.; 1990. p. 302.